This week we look at Starship publishing which you might be able to use in other RPG supplements as well. 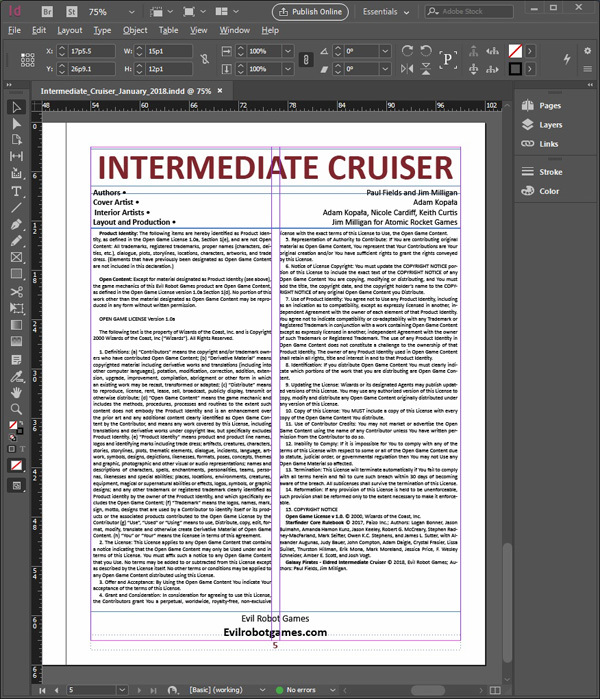 As an example we’re going to look at the Eldred Intermediate Cruiser, a ship we have as Pay What you Want on DriveThruRPG. 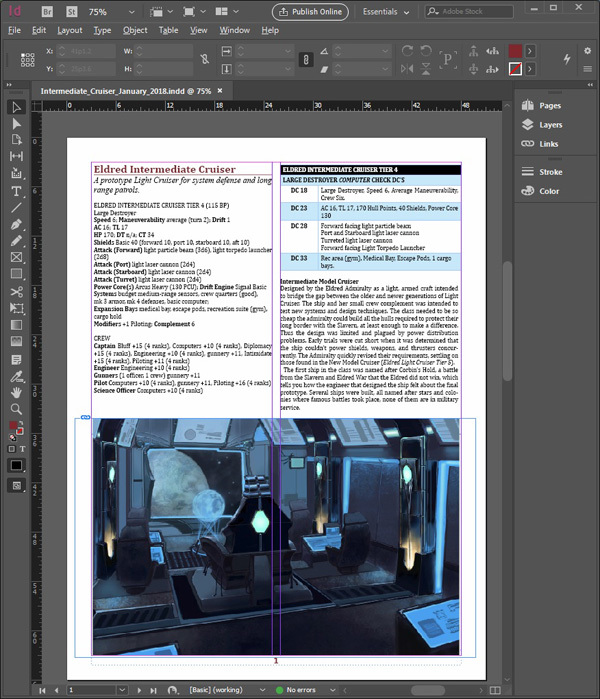 This tutorial uses Adobe InDesign Cloud version, MS Paint and the DriveThruRPG website. At this size the Logo looks centered, it probably isn’t but the visual weight of the logo is mosty on the left. The cover image of the starship is centered on the page but this time the visual weight is heavier on the right. I typically ask the artists to create a 3/4 profile image because heading straight at the camera or perpendicular to the camera are rarely as visually interesting. We’ve been using the font at the bottom since the beginning, we stick with it for consistency, but at some point we may replace it with something catchier as the title begins to take up more space on the page. Though its readable at this size, the thumbnail size preview in the Newest and Hottest sections or DTRPG makes it hard to read. When making a new product I usually open the links function and replace relink the old cover image with the new image and InDesign places the new image in the same place the last image was on the page. The artist typically does all the 3D renderings in the same size. This saves me trying to tweak each cover individually. On the second page I typically have a Starship stat block, I used to do these all by hand in Excel with two cells that tallied Power use and Build Points. I have found I like the Starship Builder at James Turner Online which is faster. The stat block with crew skills takes up most of the left column. A table of scan results sits atop the right column, followed by some flavor text about the ship class and its place in the setting. The blue and white zebra stripes of the table are easier for everyone to read including folks with some reading disabilities. The image across the bottom is a typical starship bridge for ships belonging to the Eldred faction. New ships copy over their stat blocks over the old, scan results still have to be done by hand, the order we see weapons are supposed to be by power usage, but many of the starship weapons use the same amount of power. 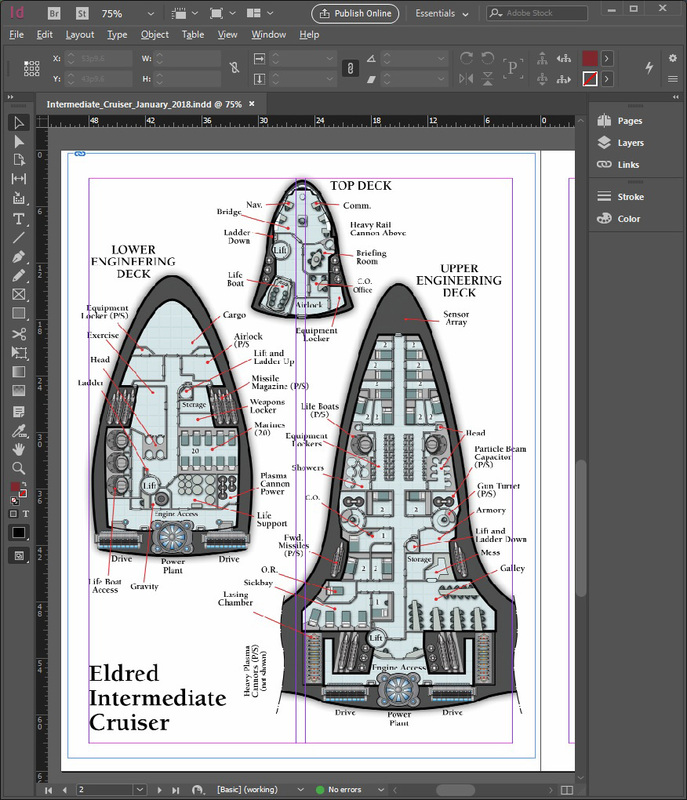 Deckplans are the most requested single feature from the customers, I have three cartographers I know that do scifi style work and the Eldred faction deckplans were all done by Keith Curtis. As with other images, I use the Link feature to relink the new deckplan image over the old one. This usually retains all of the border and centering work done on the previous image. The Art page was requested by a customer, originally the cover art was the only time you saw the ship. So there’s the title and the logo and maybe you are using the ship for your homebrew and you just want to show a clean picture to your players. Now you have one. Usually relinking the old image position to the new image file is enough, these probably take the most tweaking because some pictures are bigger than others. So this was another customer request, I take the cover/art image and open it up in Photoshop. I reduce it to 2.5 inches wide and change the DPI to 300 sice people are expected to print this page. 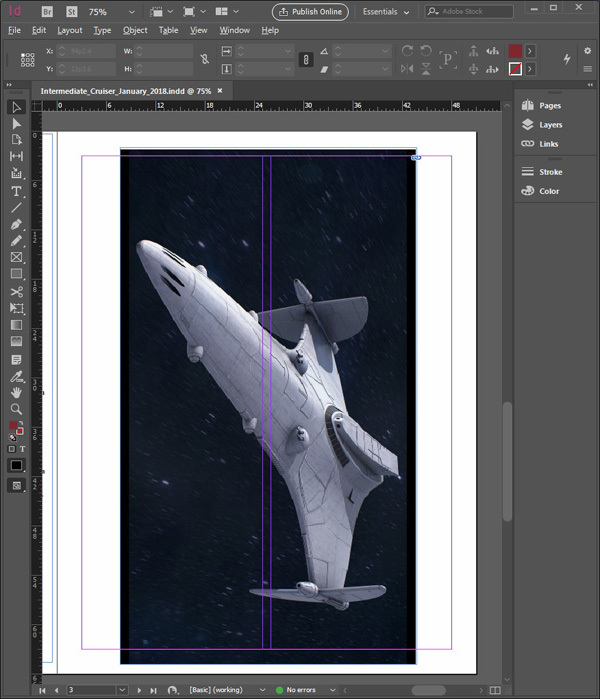 The photoshop file has two layers with the ship’s title and a layer with the ship image. I save the image with the title one way as a PNG file, then flip the image horizontally, switch labels and save the flipped image as the back view as PNG as well. Now when you complete the front and back PNG images you can simply relink the old front and back to the new front and back, InDesign will make the 14 replacements for you. Speaking of InDesign doing it for you, when I first created the pawns, I tried very hard to create 1pixel wide borders for each image in Photoshop and it was totally hit or miss. 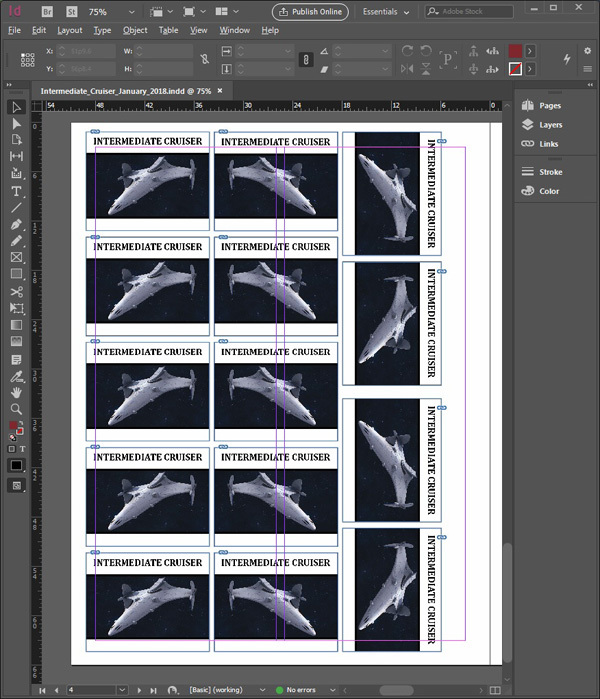 I now put a 1point wide Stroke border around each image in InDesign that still gives the user something to cut along when they are making pawns. “Game Line” – “Faction” “Ship Model” © “Current Year” , “Publisher” ; Authors: “author list”. 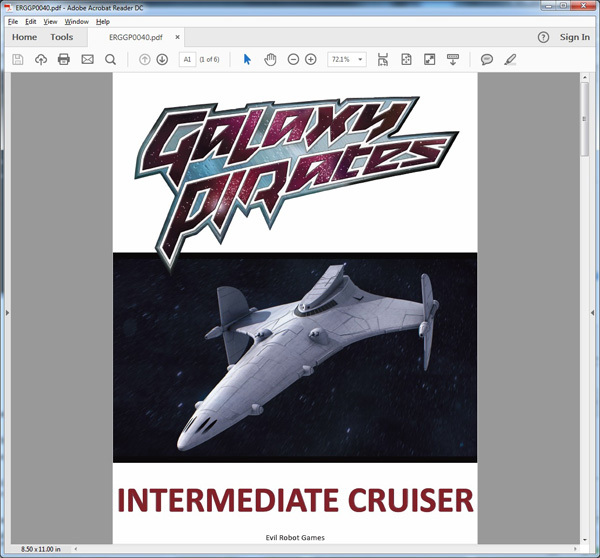 Galaxy Pirates – Eldred Intermediate Cruiser © 2018, Evil Robot Games; Authors: Paul Fields, Jim Milligan. 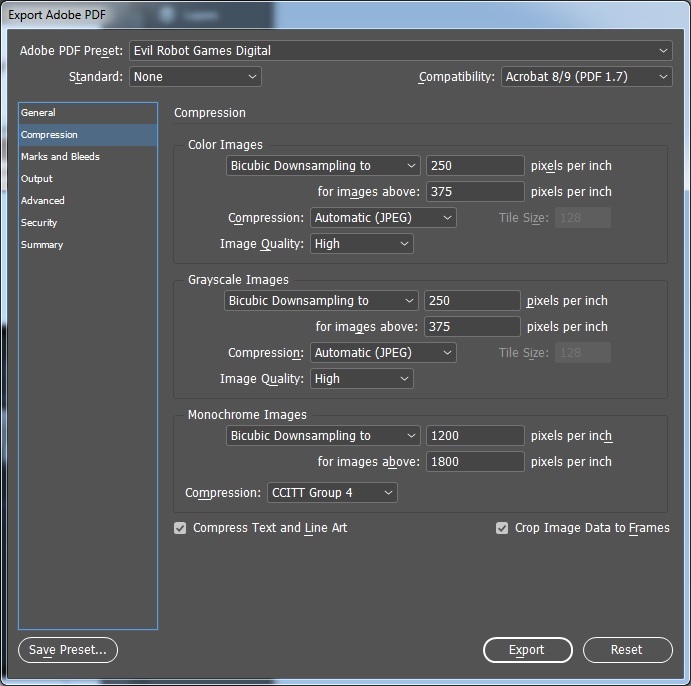 The basic Adobe settings create huge files, th DriveThruRPG settings and other settings I have found made very small files, but at a loss of image quality I didn’t like. I leave the other 5 settings pages at default. Draw a box from top left of your image to the bottom right when you let go of the mouse button it will copy your selection to the clipboard. Click Crop while the image from the clipboard is still selected, that will eliminate any extra whitespace in the default canvas. You should have a fairly clean copy of your cover in Paint. I user the same naming convention for the JPEG as I do for the PDF. Keep the saved files together for uploading. We’re going to assume you don’t have a template to use and we’ll fill out this one from a scratch. Authors, you and any collaborators, same as you put in your OGL declaration. Number of pages, Cover to OGL declaration. Price, in here you put your asking price, and if you want the title to be Pay What you Want. In my experience one in ten folks will pay you something on a PWYW title. The payment varies from a penny to full asking price, but the one in ten doesn’t vary too much. The Eldred Intermediate Cruiser is on DTRPG as PWYW and those numbers have been true for it. 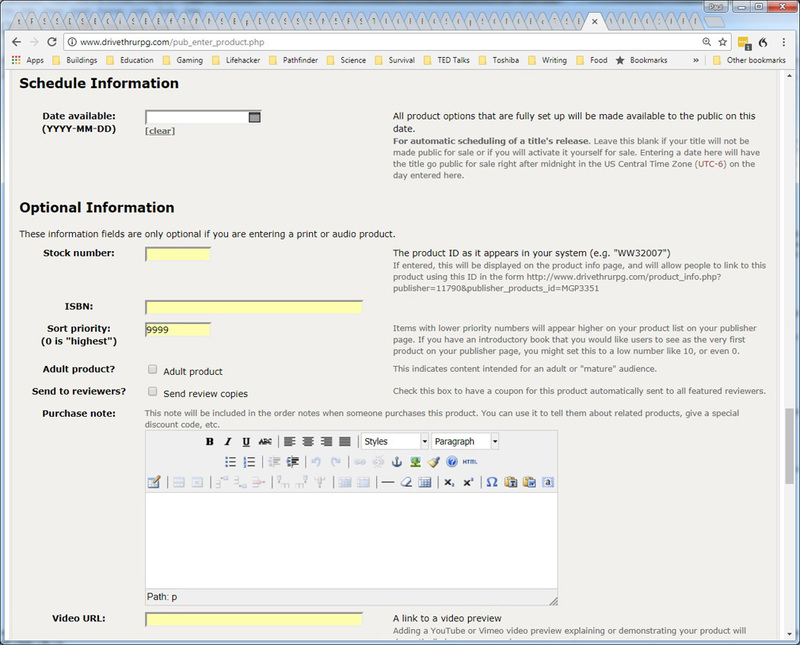 Product Page Text, this is what sells your book, don’t throw it together at the last minute. You have to seell the idea, tell em what’s in it, how its going to make their life better as a GM or player and why its worth their dollar. Cover Image, remember that JPEG we made, choose that file and DTRPG will do the rest. 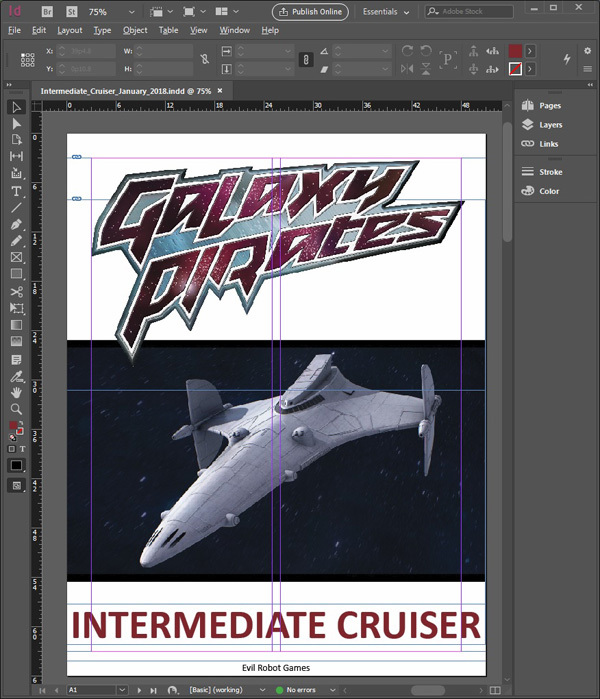 Your Publisher Categories, everything falls under Galaxy Pirates right now. File Security, watermarks aren’t default anymore, they were when I started and since I use previous product setups as templates in the first step it gets included by default on my new books. In-Page Flash preview, I always say yes and set start to page 1 and finish to the OGL page. Full size PDF preview, I always say yes and set start to page 1 and finish to the one before the OGL page. Now people may say they get to see the whole book, I’d rather someone see the whole book and walk away than have someone buy a book based on me cherry picking the more exciting pages and have a comment section full of angry customers. Schedule Info, I have never set a book to publish on a future date. Stock Number, same as the naming conventon for the PDF and JPEG files. ISBN, I don’t use it, most of my sales come from people seeing internal links on DTRPG. Sort Priority, never touched this either. Send to reviewers?, haven’t used this yet either, I have used other functions at the site to send review copies. Purchase note, write a thank you note to your customer and point them to other things by you. Video URL, never used it. 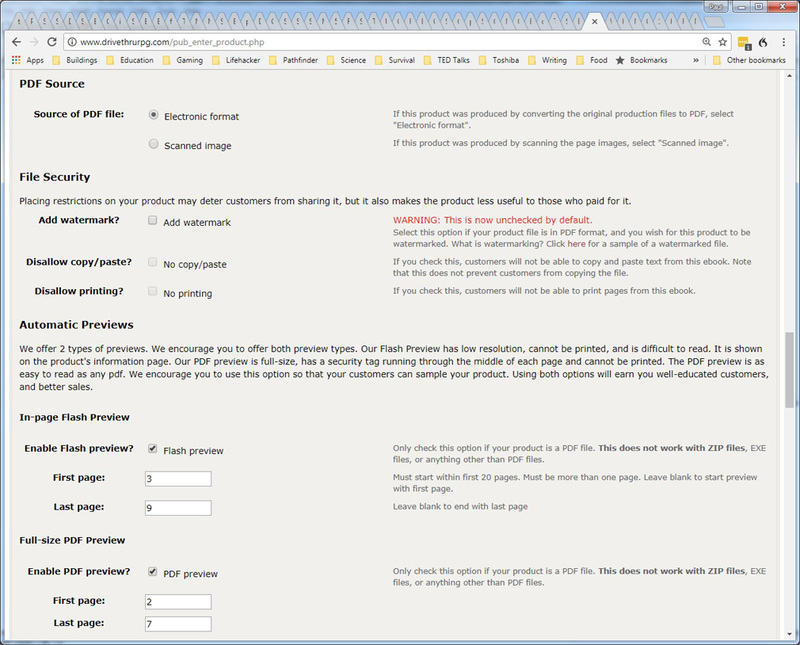 The preview description is what you wrote in product page text, if it looks good, proceed to the next step and upload the PDF file. There is a button to make the file Public which puts it up for sale. 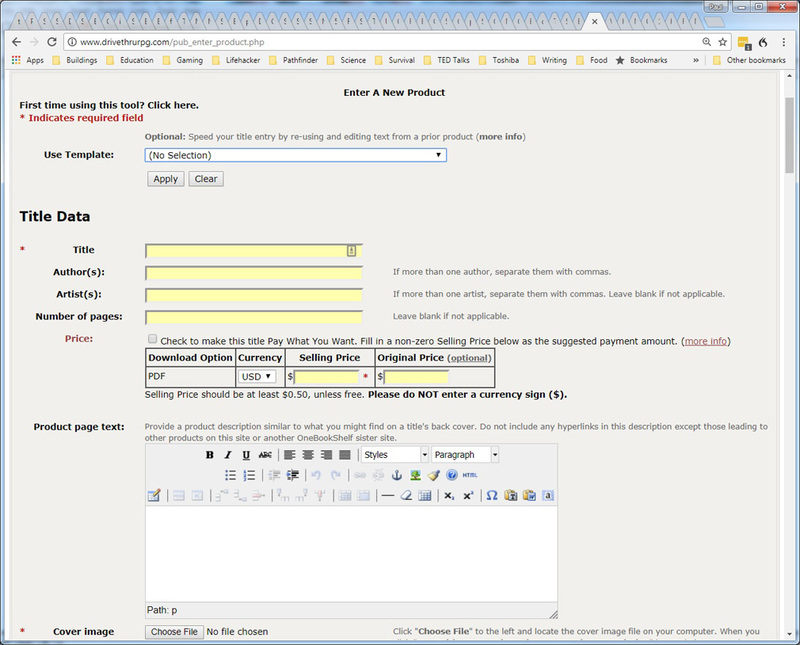 When you are done there look at the sales site for the file and check the quick preview if you chose to use it. 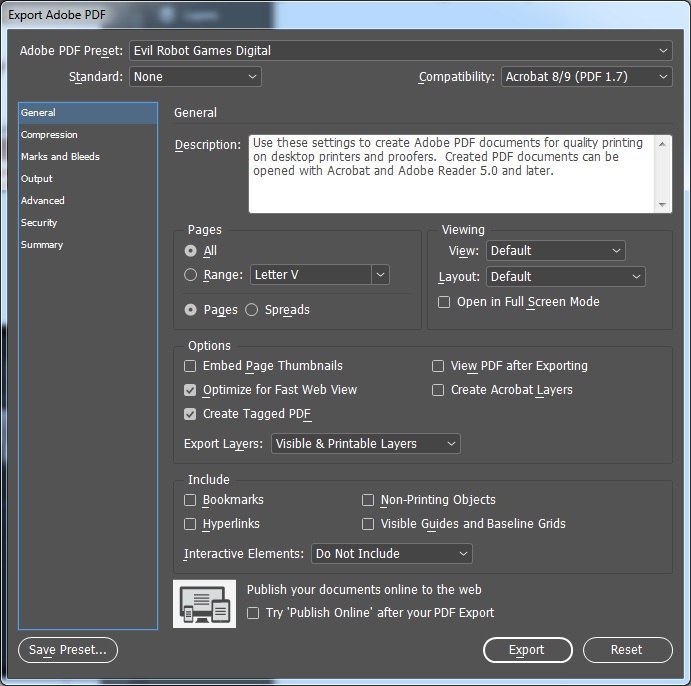 If you chose full PDF preview, it will take a few minutes to generate so be patient. I’ll come back and edit this last step with screenshots the next time I have a new product go up. Ensure that your email is correct and choose 5 stars next to Review and discussion notifications, this will tell you if someone comments on one of your products, it is not a default. 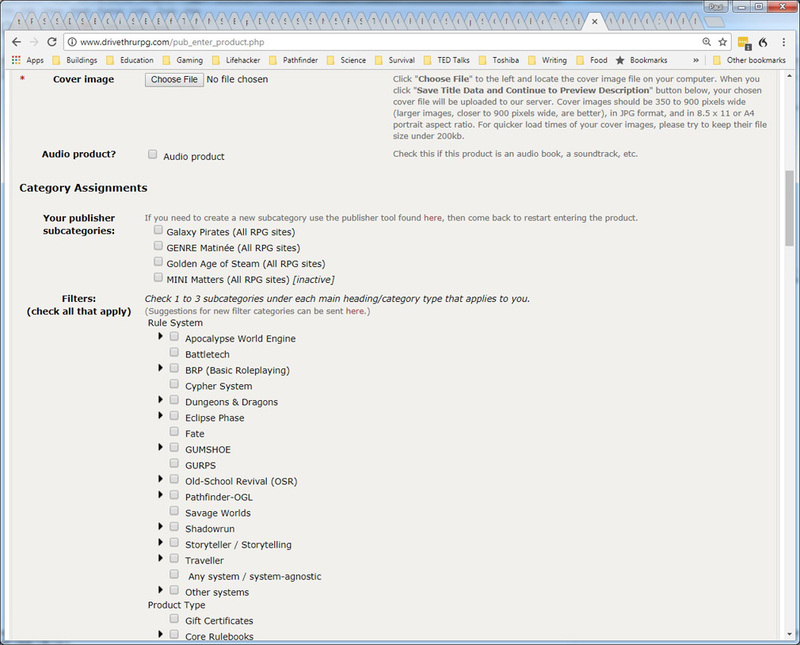 Ok, that’s InDesign and DTRPG in a nutshell, there’s some formatting stuff about 2 column layout and getting used to inserting paragraph breaks instead of hitting enter, but that’s a real product out there in the world sellng with dozens more just like it.